Uncategories Why am I not reaching anywhere in my spiritual journey? Question: "Why am I not reaching anywhere?" 1. Because of the craze of social media and so much information being shared every now and then, most of the time people read everything and try to follow that everything of informations being thrown on the internet by any xyz. This is one of path distractor as you garbage-in huge pounds of data inside and at the mind do not know how to process it. You must realize the fact that in Yoga, "aahaar" is considered very important and it's not only the food for body but also the food for mind. What you input to your mind,if going to be a part of you same as every food eaten becomes a part of you. So, be very selective when you sponge-in all that is shared because just like food has a utility to body, information has a utility to your thoughts. 2. Other mistake that sadhaks do is- following too many techniques and many oath at the same time. Remember, you can be follower to infinite number of teachers but you must be a sincere student of atleast one. 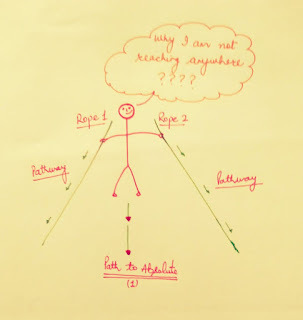 When your path is straight and instead of walking you hold different ropes in both of your hands and mind is stretched in different directions, how can you reach anywhere? Because of your curiosity, you wish to adopt n number of modalities without discriminating the real and unreal, thence, getting trapped and stuck. Just think!! 3. In today's world, rare are the students who get a direct shelter of the Guru, else Gurus today are celebrities and you just remain a follower to them being wooed by their fan following but getting no "sanidhya", hence, no chance to get individual teachings from Guru but remaining like an audience in the whole cult. Shun such Gurus as you will not reach anywhere than getting a "feel-good factor." 4. Rare are the teachers, who will put organization on the second in the list and put shishya on the top as Guru's key work is to work upon his shishya than generating revenues for the organization. Wake up and realize it in the light of ancient and millennium old Guru-Shishya tradition; this system was followed because the needs of every shishya is different and unique leaving apart the basics. When you follow, follow and follow a crowded Guru, where the Guru doesn't even know if in the crowd who of shishya has come, how will the teachings be imbibed on a personal level. Now, let's not get into the reasoning while comparing today's Gurus with Sun. 5. Enhance your quest while reading the basic texts than reading just the authors because the authors might get a different point of view of any concept but when you read the basic text, you certainly get to analyse your own state of being as well as you get insights for all what is happening around. 6. Do self-analysis on regular basis and ask questions to your teacher (if available). This will help you realise where are you lacking and what situation or emotion is appearing again and again in front of you as challenge. 7. Practice the technique which is given to you by your teacher than learning courses one after the other, cramming it and reaching nowhere. Remember, the yogis practised one technique given to them by their teacher for years and years and their teacher used to monitor it regularly while nourishing the student with teachings to hammer their mind in order to break the rigid patterns of a pre-programmed mind. 8. Save yourself from the short term programs, courses which claim you to open your chakras or kundalini or to get you any healing power overnight. It's only possible, if you can grow a fruit bearing tree overnight from a seed. Be wise. 9. In today's time, when man has gone away from nature thence, away from his own nature, his own center; we actually need to learn the "art of leaving" because we have learnt so much, we have gathered so much, be it material or be it information. This all has cluttered our body, our mind, our houses. Adopt a lifestyle, which is simple, easy and no show-off. 10. Save yourself from the termite of praise and glory, which is one of the biggest factor which kills the sadhak from inside and acts like a slow poison. You meditate for few days, you share with someone and you feel puffed up when someone praises you because you meditate. Stay away from such praises as it might give you a good feeling for a moment but later on you will realize you are trapped in this praise cage. Remember, True Guru will not praise you but he will guide you, teach you and hammer you for your ill habits. And, even if you meet such people who just praise you while walking this path, just stay away from them. 11. Listening to other's experiences can be good and motivating but when these lead to imagination that is when you are stuck and you continue to imagine further. That's where the teacher can help telling you that you must move on. Because, people today even imagine speaking to aliens which is a hoax. I believe this will help all the sincere meditators, to evaluate their journey and adopt a path which is righteous for them. If you like something from this, do follow, else continue to scroll over internet. If you like, do comment and share, it might help the sincere sadhak in their journey.